1. Add a drop of live baker's yeast and a paper filter moistened with a few drops of water to bottles containing fly food. 2. Let the flies lay eggs just to the point where larvae will hatch under uncrowded conditions (<100 larvae/bottle). This takes 7 d after egg lay at 18°C. We recommend this temperature in order to maximize the degree of polyteny, but higher temperatures can be chosen if needed, with relatively modest loss of size of the chromosomes. 3. For salivary gland preparations, use third instar larvae that are still crawling and have not yet started to pupariate. 1. Dissect one pair of salivary glands in solution 1. Try to get rid of most of the fat body cells without wasting more than a couple of minutes and, if possible, without separating the two glands. 2. Using tweezers, transfer the glands to ~40 ||L of solution 2 on a cover slip. 3. Fix the glands homogeneously by moving them slowly into solution 2 for the appropriate time (see Note 1). 4. Move the glands into 40 |L of solution 3 on a 22 x 22-mm cover slip. At this step, the glands often stick to the tweezers. Carefully remove them with a second pair of tweezers and leave in the solution for 2 min, 45 s.
Fig. 1. A schematic representation of the procedure for spreading polytene chromosomes is shown. The squashed salivary glands are represented as a gray halo below the cover slip. 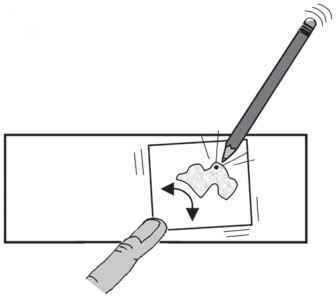 The pencil is held with the right hand while the left-hand finger moves the cover slip. the bottom left corner of the cover slip with a finger (wear Latex gloves in order to avoid acid burns). Tap on the cover slip with the tip of a pencil (it should be a soft tip like "HB" or softer, avoid "2H" type pencils) while moving the cover slip in order to obtain a lateral oscillation of about 2-4 mm amplitude (see Fig. 1). This results in cells and nuclei opening and in chromosome spreading. Start tapping right at the spot where the glands are located and then gradually move to the other areas of the cover slip. The tapping direction should be along the vertical axis. This is continued for 10-15 s, until the liquid excess has run off and the cover slip starts to stick on the slide. Tapping should be performed using the right pressure, which requires adjustment by trial and error. This step is the only difficult handling of the whole experiment and it is done slightly differently in different laboratories. 6. Squash the chromosomes and remove excess fixative by evenly pressing the slide (cover slip down) onto blotting paper (some laboratories have developed special devices for application of even pressure, but in our experience, a simple thumb pressure at the cover slip position is sufficient). Examine the preparation under phase contrast. Good preparations should contain nicely banded, well-spread chromosomes, some of which should be nonfragmented. High levels of fragmentation indicate that either the pressure was excessive or the cover slip was moved too harshly during the spreading procedure. On the other hand, the widespread presence of chromosomes wrapped in unbroken nuclei is diagnostic of insuffi cient tapping pressure. After observing the spread chromosomes, mark the position of the cover slip on the back of the slide using a diamond-tip pen. 7. Wear protective glasses and gloves. Freeze the slides by immersion in liquid nitrogen. Quickly flick off the cover slip with a razor blade or a scalpel and dip the slides into PBS. 8. Wash the slides twice for 15 min in PBS by slowly shaking the rack (at 100-150 rpm in an orbital shaker). 9. Proceed with the immunostaining or keep the slides (up to 1 mo) in 100% methanol at 4°C. 1. Wash the stored slides twice for 15 min in PBS. Transfer to block solution and shake by slowly rotating for 1 h at RT or overnight at 4°C. 2. Add to each slide 20 ||L of affinity-purified primary antibodies diluted in block solution (see Note 2). Cover with a cover slip, avoiding bubble formation. Incubate for 1 h at RT in a humid chamber (we use a box containing wet blotting paper). All subsequent steps are performed at RT. 3. Rinse in PBS; cover slips will fall off. Rinse one more time. 4. Wash by shaking thoroughly for 15 min in an orbital shaker in wash solution A, then repeat this step in wash solution B (see Note 3). 5. Rinse twice in PBS. 6. Add 20 |L of fluorescent secondary antibody (see Note 4) diluted in block solution containing 2% normal serum (see Note 5). Cover with a cover slip and incubate for 40 min in a humid chamber in the dark. Perform all subsequent steps in the dark in order to prevent bleaching of the fluorochrome. 8. Stain for 10 min in 40 |L of DAPI solution (0.5 |g/mL in PBS). Wash 5 min in PBS. Fig. 2. Survival of the labeling of the histone H4 acetyl Lysine 12 epitope to FISH after immunostaining: (A) Chromosomal DNA banding as seen by DAPI counter-staining. (B) Immunostainning was performed and a picture taken before FISH. (C) FISH experiment using a 3.5-kb probe containing lacZ sequences. A lacZ-containing transgene present in the line is inserted at position 32C. Streptavidin-FITC was used for detection. 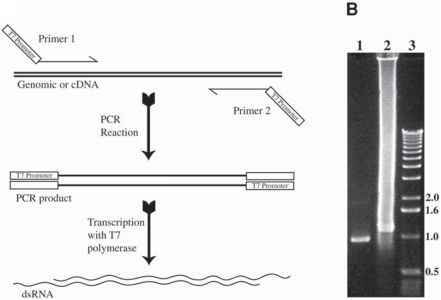 (D) The same chromosome was recorded in the antibody channel after FISH. The antibody staining survives this treatment. In this particular case, the immunostained bands are sharper than before FISH, probably because of reduction of background immunostaining upon the harsh treatments during the FISH procedure. Anti-acetyl-histone H4 (Lys12) rabbit polyclonal IgG was from Upstate Biotechnology (cat. no. 06-761) and was used at a dilution of 1 : 100. Donkey anti-rabbit (Jackson ImmunoResearch, cat. no. 3 711-165-152) was used at a dilution of 1:350. The FISH signal was amplified as described in Note 6.
proceed to FISH (Subheading 3.4. ), and record FISH images. Finally, produce overlay images with the help of image analysis software like Adobe Photoshop (Subheading 3.5.). 1. Mount the preparations in 40 ||L Mowiol or in 99.5% glycerol for cytological examination and image acquisition. 2. Examine the slides under a microscope. Good chromosome spread images are acquired using a DAPI filter and the corresponding antibody filter. The position of each chromosome set is recorded. This can be done manually by using the scale of the microscope stage. We used a conventional photonic microscope (Leica DMR8) with a stage connected to a "Leica Sensor Control Display" device. This device measures the xy position of the object with an accuracy of ± 1 |im. Formatting of the acquired image will depend on the image acquisition device. We recommend storing the image files in "TIFF" format and in "Indexed color" mode for subsequent image processing as described in Subheading 3.5.